So far, everything you have done can probably be done in your other genealogy software program. However, the Analyze Evidence screen is where Evidentia differentiates itself from other software programs. Select the Analyze Evidence tab from the menu bar. Select the Claim Type to analyze. At this point, Evidentia will present you with the relevant evidence pertaining to your selected claim. It is your job to evaluate the quality of the evidence and to provide an analysis of each claim. For example, does the evidence support or contradict other assertions? Can you calculate a date range for the event (using the Date Calculator, if necessary)? How reliable is the information in this source? Does this evidence have more merit than evidence in other sources? Review the information in each claim. 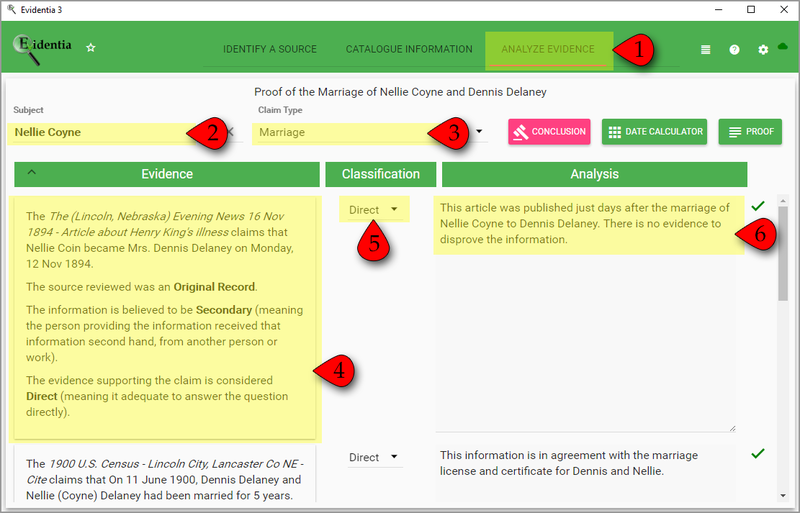 Classify the evidence using the Classification drop-down list. Is the assertion directly stated or implied? If it is implied, is by the LACK of information (negative evidence)? Write a detailed analysis. Be thorough! If you want more space, double-click the Analysis box to bring up a larger editor. Repeat for each piece of evidence in the list. Task Three: Analyze the Evidence is now complete!